Sale-A-Bration is in full swing, but I must warn you: Time is Running Out! Sale-A-Bration ends on March 31. So, I am going to spot light some of my favorite Sale-A-Bration items for you. Then all you have to do is choose which are your favorites, and decide how many FREE Sale-A-Bration items you want before it’s over. Need a refresher on what Sale-A-Bration is? Just click here. This is a stamp set and and thinlits dies that coordinate together. The stamp set is a level 1 reward (free with a $50 purchase) and the thinlits are a level 2 reward (free with a $100 purchase). The cool thing is that the Celebrate You Thinlits dies are going to carry over into the 2018-19 annual catalog which means you’ll be able to purchase them in June 2018 if you don’t get them now. So no fear of losing out! Don’t you just love this coordinating product suite? If you subscribe to mailing list, then you got my newsletter that showcased the Celebrate You thinlits dies on a scrap book page! 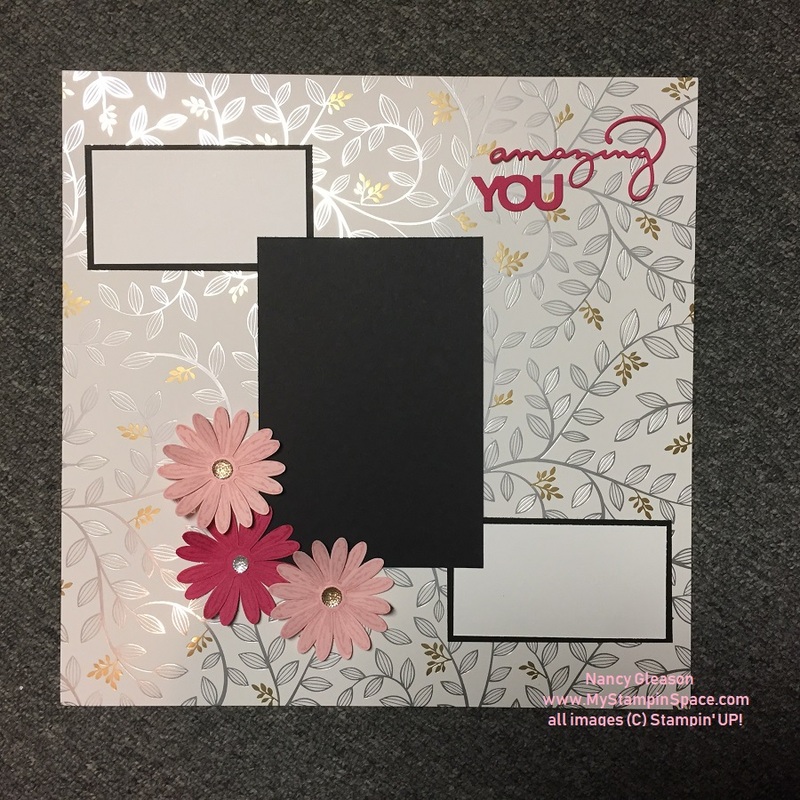 If you subscribe to my newsletter, you received the project tutorial to make this scrapbook page in my March 6, 2018 newsletter. If you didn’t, then subscribe to my newsletter now so you won’t miss out on any future project tutorials. If you want to get the Amazing You stamp set and the Celebrate You Thinlits dies, place a qualifying order when you shop my online store. It’s a great time to stock up on essentials like envelopes, adhesives, cardstock, ink refills, etc. or to splurge on a tool or bundle you’ve been wanting. Remember, Time is Running out on Sale-A-Bration so get your order in before it’s too late!